If you are anything like me and have a few pairs of boots (let’s face it, boots make the outfit! ), you may also struggle with a good storage solution for them. There never seems to be enough storage space in any house or apartment we’ve lived in, particularly for large, awkard items like boots. Lately I’ve been keeping mine in a couple of vintage suitcases, which works really well. 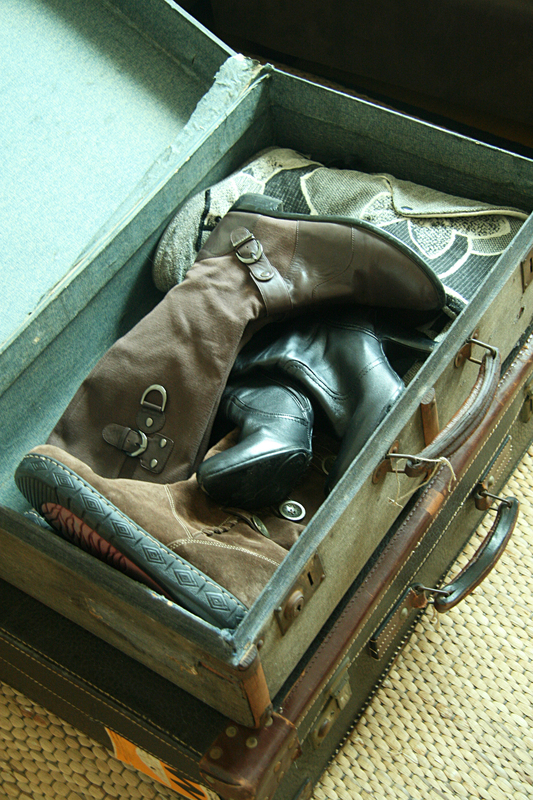 The boots are protected and kept dust-free and the suitcases multi-task as a coffee table in our bedroom. I keep the little silicon packs that come with new shoes (among many other things) and throw those into the suitcases to keep mildew from attacking my precious boots, which is a must in hot and humid climates like ours. Lovely for a mud room or entrance hall, this storage is tidy and a great use of space. 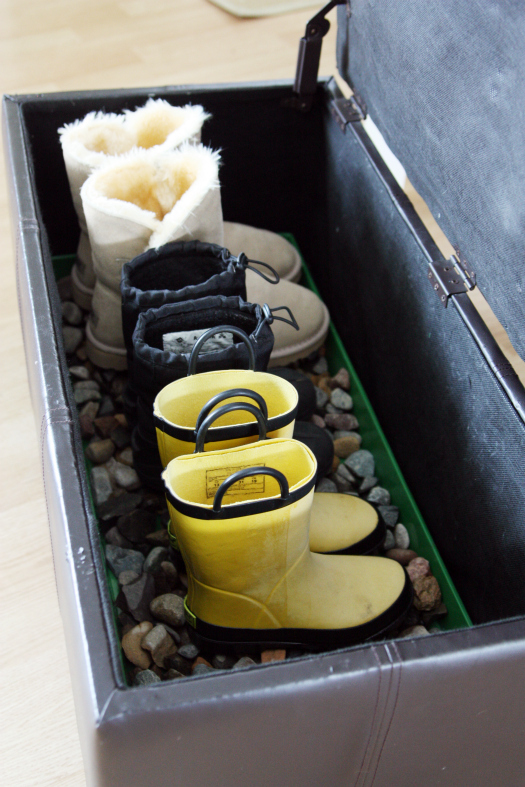 This is a excellent idea for storing boots in a chest or bench. 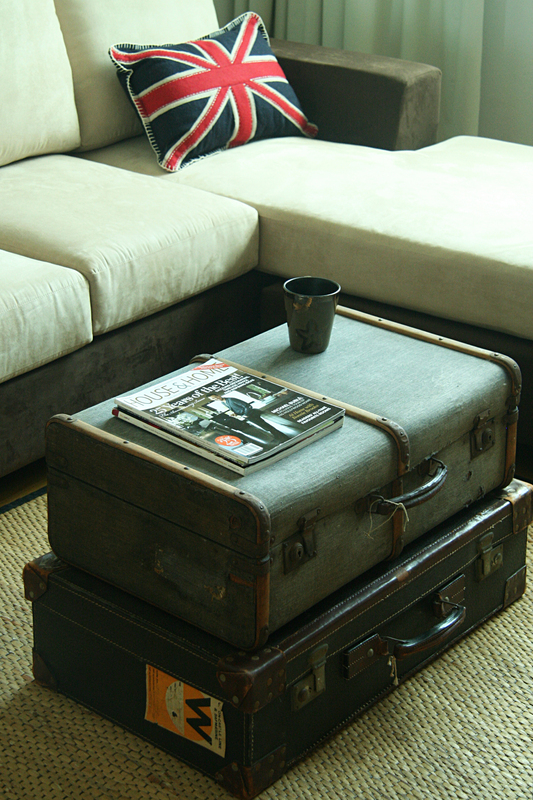 Tuck it anywhere you have extra space; under a console table, use it as a coffee table, as seating in a hallway or in a bedroom. Loving Miley Cyrus’ shoe and boot display in this photo. I think she’s onto something here. I’ve seen a version of these shelves in several shops and I’m betting a funky ladder might even do the job when you hook the heels over the step. Here is a good boot organising technique if you can afford to give up the required closet space. This is another nice storage solution that looks pretty too. You could even configure an existing hutch or cabinet to suit your needs by adding shelves to fit your own boot and shoe collection. This is a pretty good option for storage for a spare wall in a walk in closet or could probably even be configured to fit into a narrow hall cabinet or closet. Or the whole dedicated shoe closet like that of Miss Mariah. Well, girl can dream! How do you keep your boots and shoes? Is it a glamourous storage solution or merely functional? This entry was posted in boots and tagged boot organising, boot storage ideas, boots storage, celebrity shoe closets, shoe closet by Earth, Wind & Style. Bookmark the permalink. My closet is totally functional. My family and I moved to our current place like 3 years ago, and my room didn’t have a closet. Disaster! Of course. But my mother got it built with ‘specia’ shelves for my shoe boxes. I love it! I obviously had to nominate you!!! 😀 Thanx a lot! Sounds like a dream closet with a special shoe shelves!!! I’m green with envy. Have you posted pics on your blog? Will look forward to seeing a post about it then sometime… maybe after you’ve organised it…? In the meantime, enjoy for all those of us who have just regular shoe storage. Fab! Are you expanding your closet or reorganising? I love a good reorganisation. Its clears the mind.